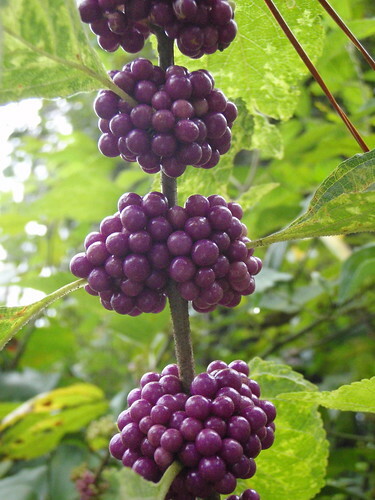 Other ethno botanical uses: Native Americans used Callicarpa americana for ceremonial uses. William Bartram recorded Native Americans cultivating Callicarpa americana in Georgia and Northeast Florida during his botanical expeditions of the 1740s. The plant has been use to produce dye and fish poison. Austin documents that traditional uses of related Mexican species include making of rafters and supports for bean vines. When Forester Wayne Bell of Moultrie pointed it out to me, he remarked that it was supposed to repel mosquitoes. Some references say "the shrub, which can grow up to 6 feet" obviously haven't seen the ones in our woods, which are well over 10 feet tall.